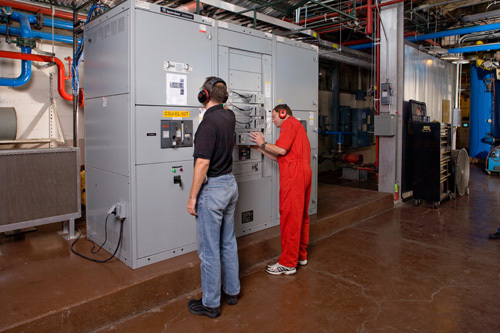 Co-located at Colorado State University’s Powerhouse Campus, Spirae’s InteGrid Test and Development Laboratory is one of the largest and most advanced grid simulation laboratories in the world. The InteGrid Lab contains the power generation, distribution and control equipment required to physically simulate portions of the electrical distribution system with significant quantities of renewable and distributed energy resources. This physical power system simulation, along with computer-based simulations, provides valuable data and information needed to determine best practices and controls solutions for effective integration of distributed energy. Testing can be conducted in grid-connected or islanded modes, and with any combination of renewable generation, conventional generation, and user load types (residential, commercial or industrial). As a nexus of research, testing, and education, this energy innovation lab offers customers and partners substantial testing facilities prior to the deployment of Spirae Wave® and other services such as Power System Modeling & Simulation, Scenario Analysis & Solution Validation, Field Deployment & System Commissioning and Operations & Maintenance. Through the Lab, Spirae also offers grid scenario simulation services. University and industry partners also benefit from the InteGrid Lab through research, testing, and education. Technologies examined include wind, solar, cogeneration (power and heat), microturbines, fuel cells, and plug-in hybrid electric vehicles, as well as demand response and load management at residential and industrial/commercial sites. The InteGrid Lab and Spirae’s Network Operations Center (NOC), also serve as the primary education facilities for the Center for Smart Grid Advancement (CSGA). Simulations in the Lab provide hands-on training for power system engineers and allow users remote access to energy assets in the NOC via visualization simulations.